Community Professional Loudspeakers is introducing the new Commercial Design Series, a comprehensive family of ceiling, surface mount and pendant loudspeakers designed to meet the needs of installations requiring high performance at a competitive price. Commercial Design models offer a choice of 4.5-inch, 6.5-inch and 8-inch driver sizes, and deliver Community’s legendary sonic quality, exceptional speech intelligibility and proven reliability. The entire Commercial Design family features uniform sound quality throughout the series, providing excellent consistency from model to model. The Commercial Design Series was designed to complement Community’s Distributed Design family of high-performance ceiling, surface mount and pendant loudspeakers in a combined installation. For this reason, Commercial Design utilises many of the same technologies as Distributed Design, including real compression drivers and Tru-Phase phase plugs for high output and low distortion. 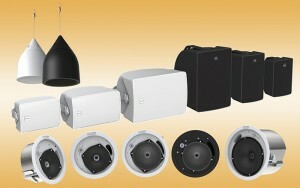 Commercial Design ceiling models also incorporate labour-saving installation innovations like Community’s exclusive Drop-Stop technology, while the use of compression drivers and proprietary LF transducers results in higher sensitivity and higher maximum output than competitors’ models in a similar price range. All Commercial Design models feature Euroblock input connectors, Community’s exclusive external loop-through wiring design, weather-treated drivers, and corrosion-resistant dual-layer powder-coated grilles. Commercial Design ceiling models are ETL listed to comply with UL1480, UL2043 and CSA60065, and the pendant model conforms to UL1480 as well. Commercial Design surface mount models have passed compliance testing for MIL-STD-810G and include a low profile multi-angle pan-tilt mounting bracket for precise aiming over a broad pan-tilt range. All Commercial Design models can be painted to match room décor and are equipped with a built-in autofomer for selectable 8 Ohm or 70V/100V operation. The new Commercial Design Series from Community provides an affordable solution to unobtrusively provide even coverage and great sound quality from zone to zone throughout an entire venue.